The Young Israel Jewish Cemetery in Norwalk, founded in the 1938 by Congregation Bnei Israel of Los Angeles, the Houston Street Shul of old Boyle Heights. Today I invite you to take a personal journey with me through Jewish life in the Los Angeles Eastside. I would also like to continue in the theme of recognizing smaller and lesser known Jewish sites of the area. On this day we are doing something different, we are starting out our journey in reverse. Believe it or not, to date none of my historical videos have been planned out. I’m not a tourist, I’m a local. Usually a video comes about because I’m in the neighborhood and someone asks me to explains something as we are passing, and then we snap a video to capture my responses. Today I am presenting my photos and a re-cut video with a bit of newly added audio commentary, documenting a recent visit to two special Jewish sites on the Eastside of Los Angeles County. One in Norwalk and the other in Boyle Heights. Along the way we are also going to tell the untold story of the migration of Jewish people, deeper into the suburban eastside. Into the southeast cities of Los Angeles County and the San Gabriel Valley. This day I was actually in the dentist chair when I got a wonderful question from a friend from the southeast-side. His inquiry gave me a welcomed distraction and mission for the day! He wanted to find out what I knew about a small burial site out in Norwalk. Knowing that I would be passing right next to there on my way home, I decided to make a quick detour into the neighborhood next the Metro Green Line Station in Norwalk to explore this topic a bit. Crossing under the 605-freeway on Foster Road, I make my way through a broken-up and oddly shaped neighborhood. Over to the southernmost fragment and point of Curtis and King Road. And right there in between Briar and Tolly, there sits a small Jewish cemetery. This cemetery is the Young Israel Cemetery in Norwalk, founded in 1938. This site holds approximately 500 Jewish burials. 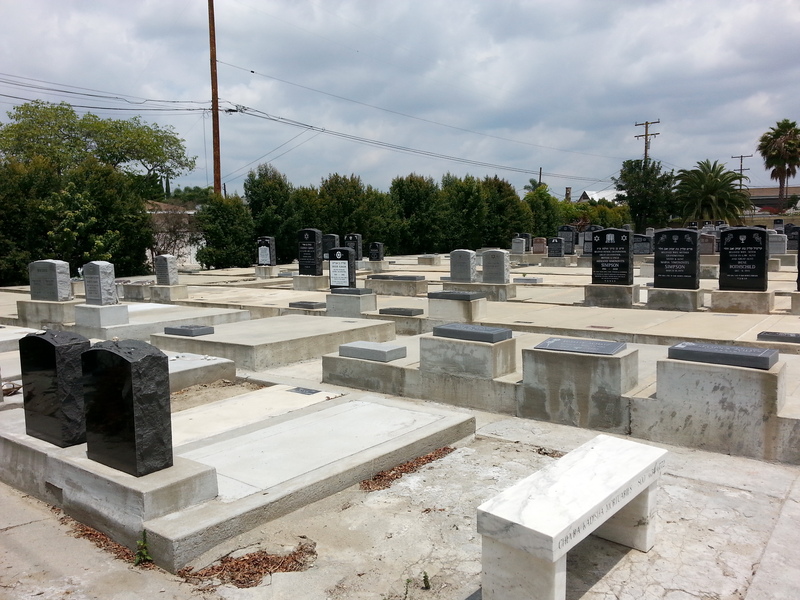 It is a well maintained site, run by the Chevra Kadisha Mortuary – the Orthodox Jewish sacred burial society. 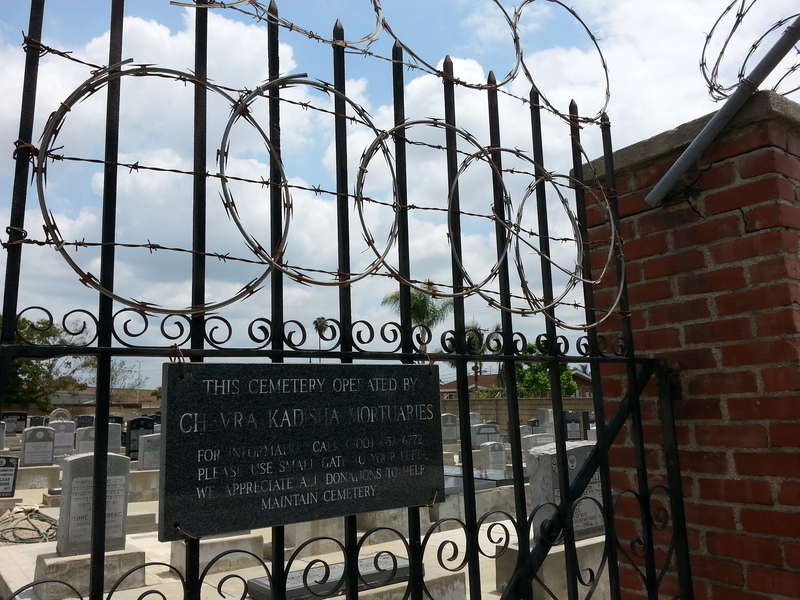 The Chevra Kadisha also runs other well-known cemetery sites in the area. One of them being the Beth Israel Cemetery in East Los Angeles on Downey Road, near Olympic Blvd. And another being the Mount Carmel Cemetery, near the City of Commerce. Though, it is important to note that this site here was not founded by the burial society which operates it today. In-fact, we are told by oral history that this site was founded by the Houston Street Shul in Boyle Heights. (Mort Silverman) And that it was later bought by the Chevra Kadisha. So here we are, standing in front of an often forgotten cemetery, which was founded by a forgotten synagogue. 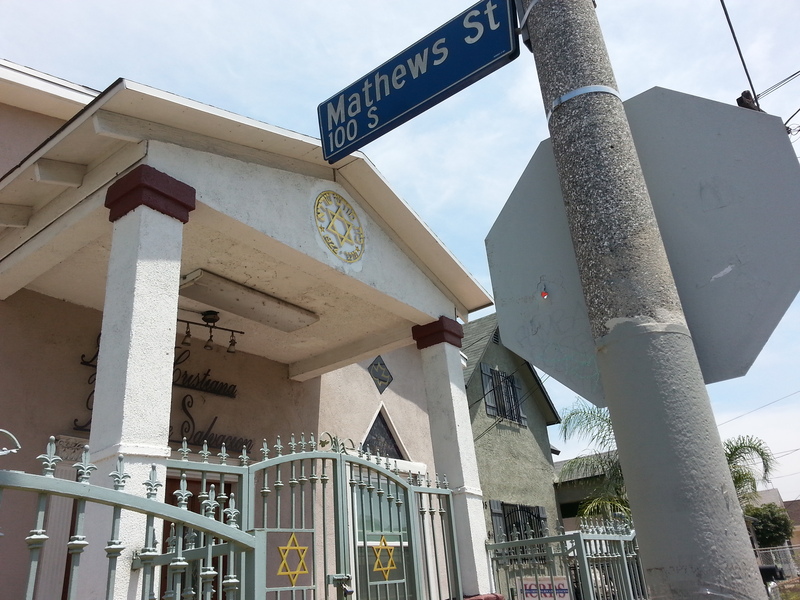 We are also going to take a look at the shul along the way as well, as we make our way back to Boyle Heights. But first we need to take this all in. One might wonder, why is it that a Jewish congregation in old Boyle Heights would have chosen a burial site all the way out here in Norwalk? And as most of the burials are more recent, so why would this remain an active site even after the closure of the congregation which founded it? The answer to the first question of why here, this is only obvious to those who know about the complicated history of displacing cemeteries in the Los Angeles area. At the start of the 20th century nearly all the original cemeteries inside the city were displaced. They were forced to relocated their sites and bodies elsewhere: as most notably in the case of the original Jewish cemetery around Chavez Ravine. The fear of this possibly happening once again compelled Jewish leaders to pick burial sites which were outside of the official city limits, into LA County territory. They located their burial sites in places this far out not just because there was open land here, but more so because they believed picking a site out here would be safe from future development. They began to put great attention into picking cemetery sites which would not have to be quickly uprooted and relocated. So that their dearly departed would not be disturbed. As for the reason that this Jewish burial site would remain significant, it is clearly because Jewish people and their families had migrated into this area. Necessitating the continued operation and maintenance of this sacred burial site here. My friend who posed the question about this site is an Ashkenazi Jew, whose grandparents had left Boyle Heights to the southeast cities. My own Mexican-American grandparents from Boyle Heights and Compton, they would also eventually relocate to this southeastern corner of Los Angeles as it became developed with tract housing. This was the place for the up and coming, with a mixture of working-class and some professional families. In the early years after World War II and the Korean War, this part of Los Angeles would attract many suburban aspiring people following government contract jobs. The area would also swell with prominence as this area became an important development and production area for the aerospace industry. Not far from here Rockwell Aerospace would later produce the NASA space orbiters. However, as the cold war and the space program slowed down this also meant a great economic lull in the area. And then the neighborhood around here was further depressed by highway development in the area. When I was a kid much of this area was just rows of condemned houses. Houses which had been purchased by the county, left boarded-up and rotting for decades, then eventually razed in order to make a corridor for the 105 Century Freeway in the late-1980s. A demolition corridor which stretched through the struggling parts of the neighborhoods of Norwalk, Downey, Lakewood, Lynwood, Compton, Watts and on to LAX Airport. When I was little my grandparents owned several business just across the street from the corridor. And I went to private school right up against the corridor for a while. This corridor was the area featured in the most notorious punk-rock movie of all time, “Suburbia (1983)” by Penelope Spheeris. Which is a story of gutter punks occupying a distressed and crumbling suburbia. Though a fictional movie which takes great liberties with the story in their nod to the historical narrative, it does actually capture much of the complaints of locals throughout the corridor and the media hype surrounding all of that at the time. In order to grasp and visualize the impact of this on the area, I also highly recommend the exhibition titled, “In Our Path” by Jeff Gates. 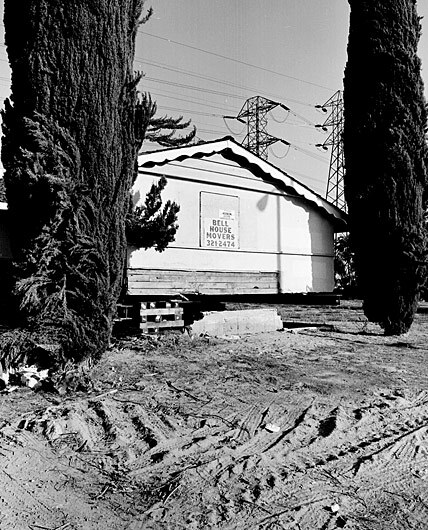 The Young Israel Cemetery is near the San Gabriel River and high tension power-lines which segment this area as much as the freeways do. It’s the proximity of this site to the river which catches my attention. This burial site was founded in 1938. The same year Los Angeles suffered one of the most destructive deluges in history, which devastated much of the river basin areas in the months of February and March of 1938, all the way down to Long Beach. It was this severe flooding which later that year caused the City of Los Angeles to adopt the policy of concrete paving the rivers. Which leaves us with a mystery to explore. Does this site here exists in-spite of that dramatic flood or as a result of the literally sweeping changes which came to this area at that time? 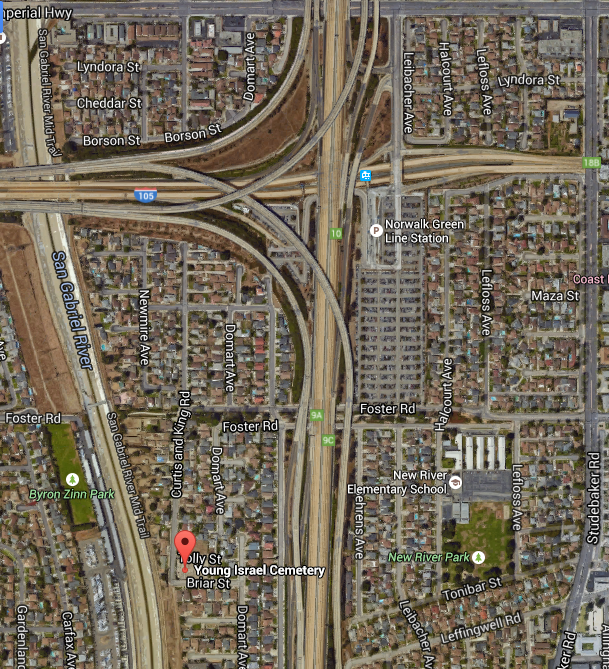 So here we are just near the widened 605-freeway, you can hear it. Near the interchange to the more recent 105-freeway, you can see it. Quite honestly, we are very fortunate that this site still continues to exist after such sweeping changes around here. Had engineers planned a little bit differently, this site could have easily have been taken by one of our infamously controversial roadworks. 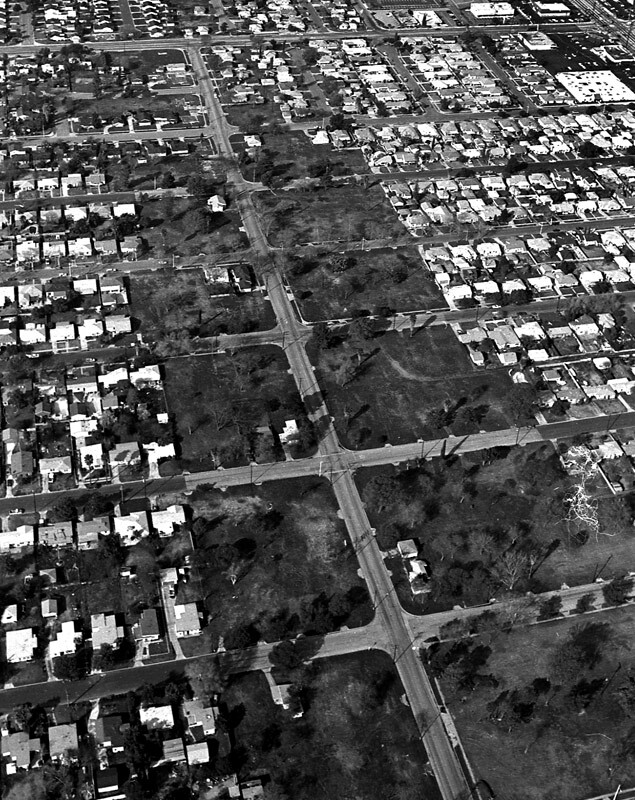 Highway expansions which have repeatedly displaced so many people and places in less affluent neighborhoods; as had also been the case in the classic era of Boyle Heights. But before I head back towards Boyle Heights, I pause to say a few prayers and pay my respects. And for a while I take comfort in seeing carefully placed stones on many of these graves, signs that there are local loved ones who have recently come to visit these graves. Paying respect to the dear souls who have come to rest here. זיכרונם לברכה… May their memories be for a blessing. 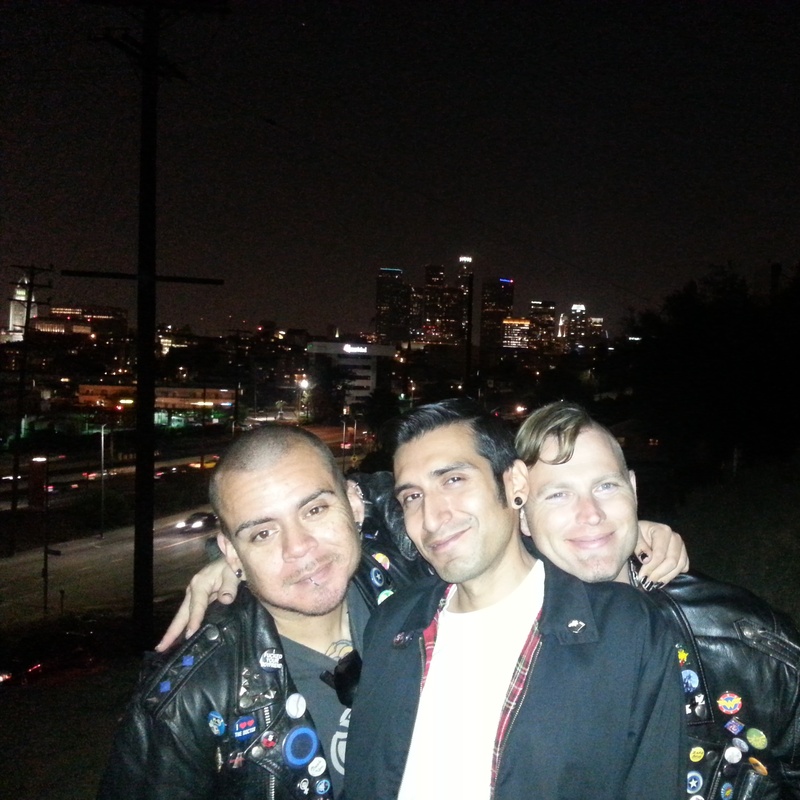 So now we make our way back to the historic core of the eastside – to Boyle Heights. We make a journey in reverse, a journey that many of our parents and grandparents have made. The only noticable sign that this Spanish-speaoing church was once a synagogue are these Lions of Judah, guarding the two tablets of Torah. The raised Hebrew words of the Ten Commandments appear to have been sanded down entirely. Many, if not most, local minority families have their roots in Boyle Heights. The area which was once the officially designated minority enclave and has remained a working-class community to this day. For many immigrant families, this was both their Ellis Island and first homestead. The way the eastside generally works is this way: Everyone starts out around Boyle Heights and East Los Angeles. But as a family becomes more financially secure and more integrated, they tend to migrate to the more suburban southeast neighborhoods. Conversely for lifelong eastsiders, families falling on hard times sometimes moving back to these more affordable old neighborhoods when times become tough again. Migrating patterns up and down the eastside often closely related to one’s economic security. Unlike most of my family, I’ve lived in the rougher neighborhoods more often than not. Getting older, I have naturally wandered back to this my comfort zone. But the path that we take these days is different from the ride I used to take in my childhood and teenage years. The 460 Express Bus no longer takes the scenic route through the greater eastside, with stops up and down the 5-freeway, then coming into town up Soto before crossing the Los Angeles River viaducts into downtown. The 460 now takes the 105-freeway corridor and 110-freeway through South Central LA on its way to Downtown, so now I go the long way around on my way up to the neighborhood. One of the things which makes the neighborhood of Boyle Heights so special and worth the ride, is that it has all kinds of hidden treasures. All these interesting remnants of a diverse cultural and religious past in this old neighborhood. Still after all these years, I notice something new every time. 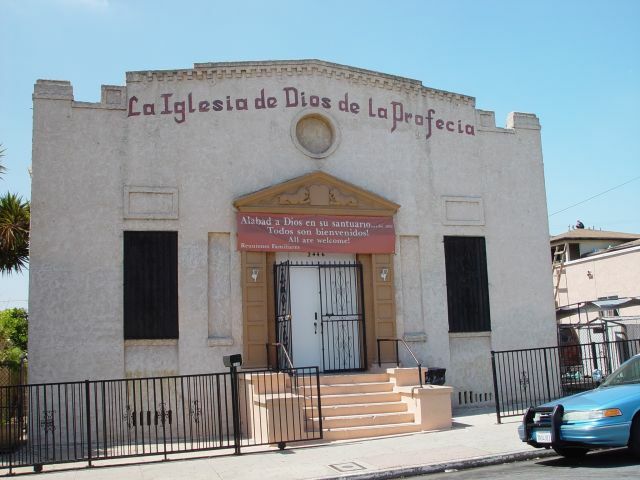 “La Iglesia de Dios de la Profecía.” The face of the converted synagogue, before the most recent beautification. And so it is on this day as we find ourselves in front of the old Houston Street Shul – formally known as Congregation B’nei Israel of Los Angeles, founded in 1932. This lovely little vernacular neoclassical style building was originally built to house an Orthodox Jewish congregation. 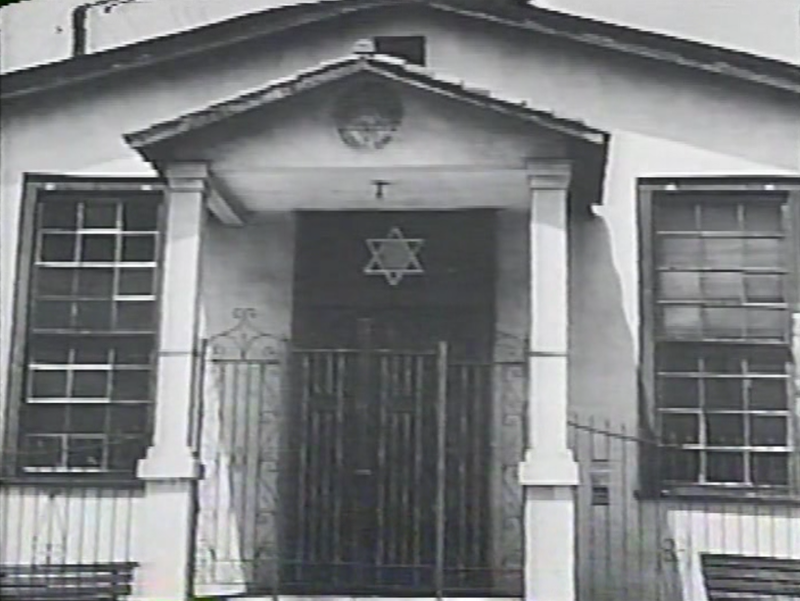 It was one of over 30 synagogues in and around the area of Boyle Heights, which were most active in the first half of the 20th century. This building sits amid a bustling neighborhood. Right below Wabash and just shy of the rumbling of the freeways which today curve painfully close to this area, here sits this charming little building. Distinct in its style and sturdy in form, it catches your attention. Even more so on this day. The building has been recently repainted a classic golden color. No longer appearing dingy and musty as before, the building looks quite alive and cheerful again! 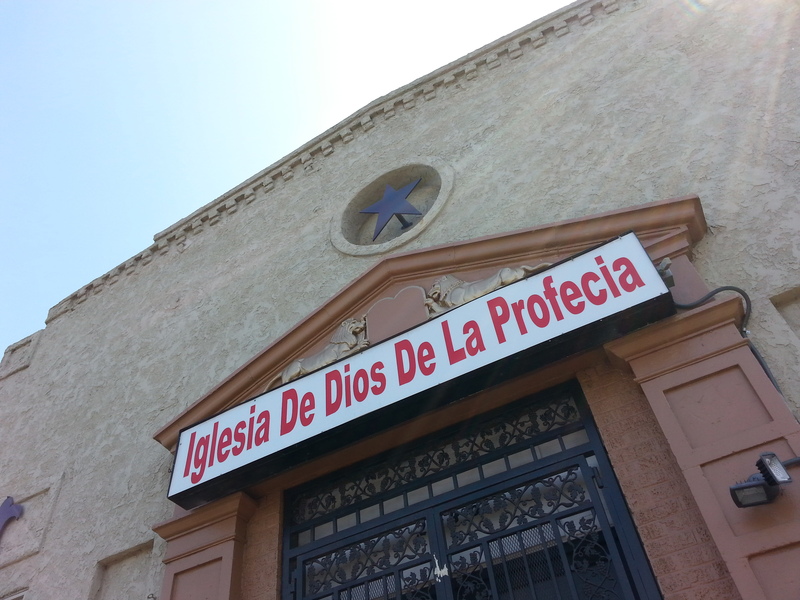 Also recently being brightened up with a new illuminated sign over the doorway, announcing the church which has for many years owned and operated this site: La Iglesia de Dios de la Profecía, a Spanish-speaking Pentecostal church. As I begin to admire the building, my attention is immediately drawn to the only noticeable Jewish symbolism which is left on the building: Two Lions of Judah, guarding the two tablets of the Torah. This is all there is to explicatively tell us what this site once was. Yet even these signs are not well-preserved, as the church seems to have sanded down the Hebrew words of the Ten Commandments on these decorative Torah tablets. As I move in closer with the camera to admire them, I notice the people in the neighborhood and the lingering Mormon missionaries all becoming curious as to what I’m seeing here. What looks so interesting up there, are they missing something? As I get closer my attention is then drawn to the door-frames of the main entrance. On each side of the door are square indentations. Painted in and looking like exaggerative block molding. However, looking closely I could see the faint shape of the English and the Hebrew script of Yiddish in these spaces. Beneath thick brown paint are the memorial cornerstones honoring the founders of this site. As much as I’m excited to seeing the building still exist and having better days. I’m also crushed over how little there is left to testify of its unique and celebrated past. This building is like most of the former Jewish religious sites, few of which have any remaining signs or homages to their honorable past. Though the building in impressive in its own right, even aside from the religious symbolism. And while this building is not as imposing and dramatic as the other former synagogues of the area, sites such as this are significant precisely on account of their humble nature. This build has an honored past as being the realization of the aspirations of poor immigrant Jews. Bearing witness to the struggle and the sacrifice it took for new immigrants to establish this splendid site, all this during the lean years of the Great Depression! It is strikingly clear that this site has been overwhelmingly changed since then. For this reason some feel that the historical significance of sites such as this has been irreversibly effected and in most cases lost entirely. However, I am of the optimistic belief that as in the case of the 2nd Street Shul, there can be found a way to restore the hidden heritage of sites such as this. To honor their past glory, as well as testify of the historical diversity of this culturally rich neighborhood for generations to come. I wonder, would this church ever embrace that heritage and restore the site if they knew the cultural significance and historical impact of it all? And might this church consider restoring the Hebrew to these tablets out of respect to the Ten Commandments and the “Old Testament?” As we have seen these type of inspired restorations in other places in this neighborhood already. Time can only tell. As I go between gawking and speaking into my phone to document the site for quite a while, the people hanging out on the block get even more curious. Surely I’m not just interested in the new paint job! So I strike up a conversation and share some pleasantries with a family next door, who is seemingly having tardeada on this warm day. They give me the lowdown on when the latest upgrades have happened on the building. And I also share with them a bit of the history I know about this site. History in this side of town is always a most engaging topic, as people love to reminisce about the golden era of this area to no end. And even more today people are genuinely curious as to how and why things have come to be in this old neighborhood. Though that is a very complicated question to answer, I ask people to really consider at least one thing which has repeatedly displaced people and heaped hardship on this community. I point towards the freeways which are rumbling all around us. And ask people to remember how our neighorhood and our own families were fragmented, as well over 10,000 people were displaced here between the 1940-1950s to create the web of freeway interchanges which carved this community apart. Which came with sweeping displacement for Jews, Latinos and all other residents. Many people eventually moved away because their grandma’s house was taken by eminent domain for yet another freeway project, and then their own. Some of our families even being uprooted more than once by the freeways here. Not just families, but many business holdings being ripped asunder by development. This made many people finally choose to move on to other more assured areas, including the surrounding communities. 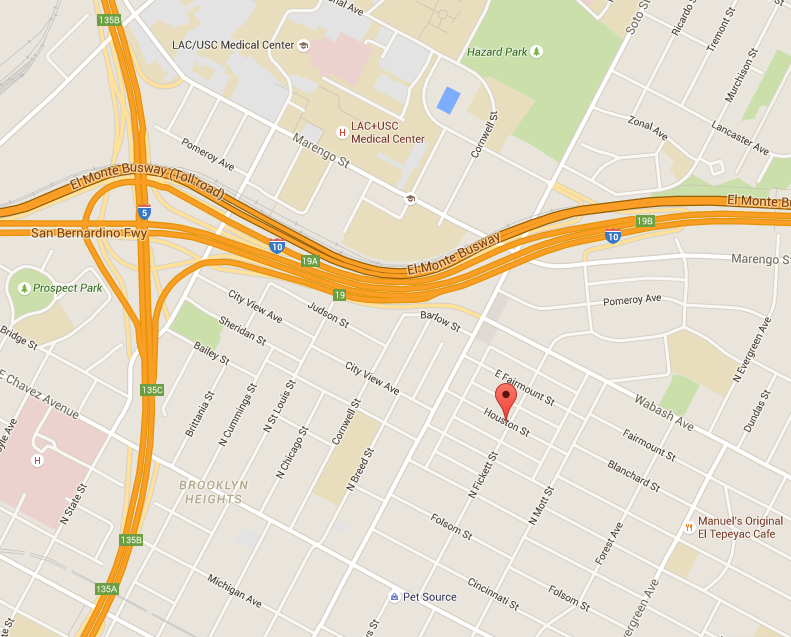 Consider the Freeways: This marks the location of the old shul. I ask people to consider how our city and our own families were fragmented, as well over 10,000 people were displaced here between the 1940-1950s to create the web of freeway interchanges which carved this community apart. Which came with sweeping displacement for Jews, Latinos and all other residents. This image shows the impact of two of the half-dozen major freeways-highways which have encroached upon and even slice through this community. For this reason I reject the one-direction narrative. And the assumptive ideas which lend to an over-simplified narrative which is crudely summarized as “white flight.” And it takes a native and lifelong eastsider to challenge that old suspicion – and often character judgments which comes with that – as it is most often posed by the younger eastsiders of today. I ask our local people to also reconsider this: The favored narrative always follows the mass migration of Jews out of Boyle Heights to the Fairfax, westside and San Fernando Valley. However, there have been significant numbers of Jewish people who have continued to migrate further into the eastside. Indeed as early as the 1920 Jews started migrating out of Boyle Heights and City Terrace, to places such as Highland Park and Montebello. There was no place else for most people to go in those days, but deeper into the eastside. Then in the 1950’s after the end of housing discrimination, many more Jews migrated even further into the newly expanding suburban areas of the eastside. Founding several wonderful Jewish congregations and cultural centers on this side of town. Each of these congregations growing out of far less than homogeneous communities, which has fostered a unique multicultural and progressive character for shuls on this side of town. Congregations which also notably attract many local bilingual Spanish-speaking families! The Jews of the Los Angeles Eastside aren’t entirely gone, it’s just that the Jewish people of today’s eastside are much more spread out. And in recent years, many families are migrating even further yet into the San Gabriel Valley and also venturing into Orange County. Once again, migrating to newly expanding areas. As time passes the Jewish history of the greater eastside area becomes more obscured. However, its important for us to note that significant amounts of Jewish people have come further into the eastside to live out their lives and also to rest in peace. “Beit Midrash Srere” (בית מדרש שרירא) of Los Angeles, founded in 1922. This modest old synagogue was once one of over 30-some Jewish congregations in and around the area of ‪Boyle Heights‬, east Los Angeles. Though many of us know the larger shuls of the area, its important to keep in mind that many local Jewish congregations of the classic era operated from store-fronts and mere shteibles – little buildings, small houses like this. As struggling immigrants, that was the best many of them could afford at the time. And so it is to this day in this community, that we have many immigrant churches operating from store-fronts and re-purposed synagogues. Though small, each of these congregations have in their own way left a lasting mark on the area. Something which needs to be recognized and celebrated. Beit Midrash Srere, founded 1922: The original face of the building, before the windows were changed and made smaller. We are taking some video and pictures of this site today, because it has gotten a major make-over. This building is looking better than it has in years! Though its sad to see that few of the original Jewish fixtures remain here. I’m told by people who grew up on the block that many Christian groups have come and gone over the years, trying to change the gates and remove the Star is David from the building. And that city officials and Jewish groups didn’t let them. One group had removed the gates with the Star of David on them. Though the more recently crafted gates have been decoratively adorned with both crosses and Jewish stars, which are inlaid into them. I think it’s really important to maintain these treasures of the past to the greatest extent we can, because these are living examples of our diverse past. Many of these sites have their Jewish elements historically registered, some of these buildings even come with the sales contract stipulating of them not to make changes which would jeopardize the historical integrity of the sites. But I’m learning that this is something which is hard to maintain when the building has changed hands so many times. Unbeknownst to many, Christian Messianism and Hebrew-Christians sects among Latinos have been growing in popularity since the 1970s. Most developing with no direct connection or relationship to the Jewish people, yet. 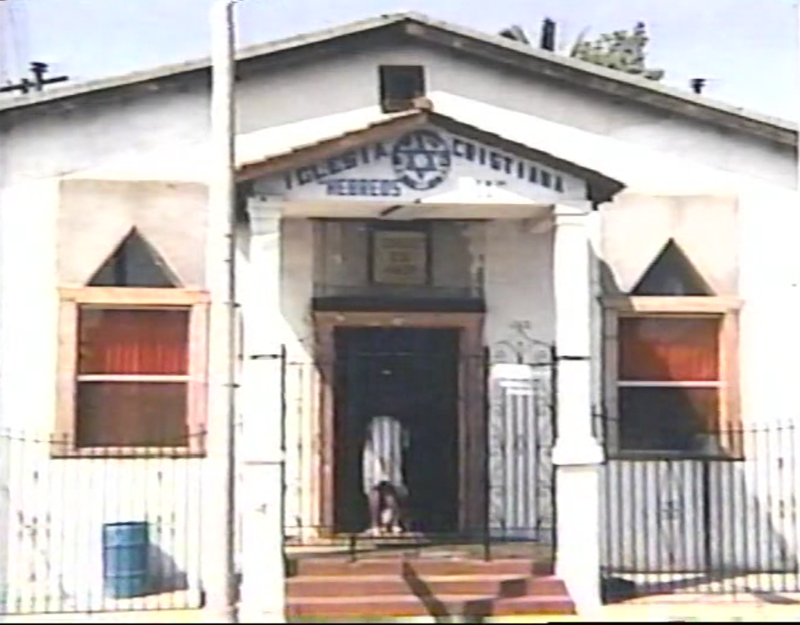 Interestingly, one of the Christian groups which occupied this site at one time was the “Iglesia Cristiana Hebreos,” a Spanish-speaking Hebrew-Christian congregation, a form of Latino messianic church. It should be noted that there are actually a few Jewish sites in the neighborhood which have been well maintained by Messianic sects or churches which feel great affection for the Jewish symbolism. Hopefully soon we will explore more of these sites together as well! These marks and measurements starting appearing on the cherished arches of the Los Angeles Sixth Street Bridge this past week. We think that this could be marking the cut marks for their removal. So far we don’t know what’s going to happen to the arches. Hopefully the metal can be reused for new fixtures, and thus kept on site with new life and significance. 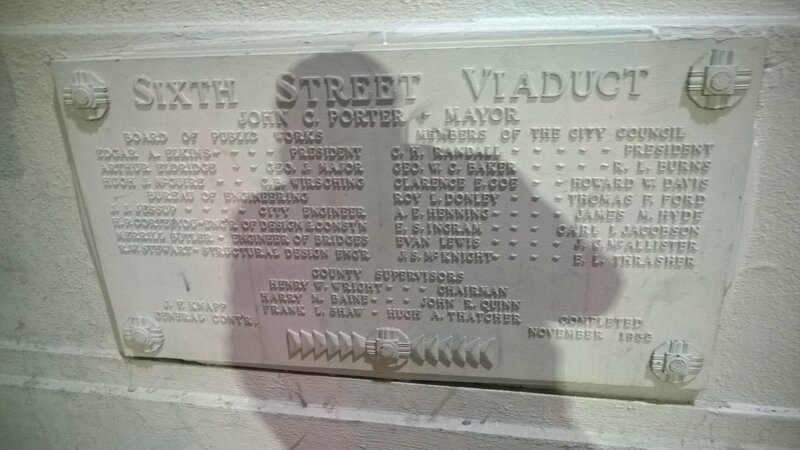 This past week the city contractors also took down the original dedication plaque for the Sixth Street Viaduct. 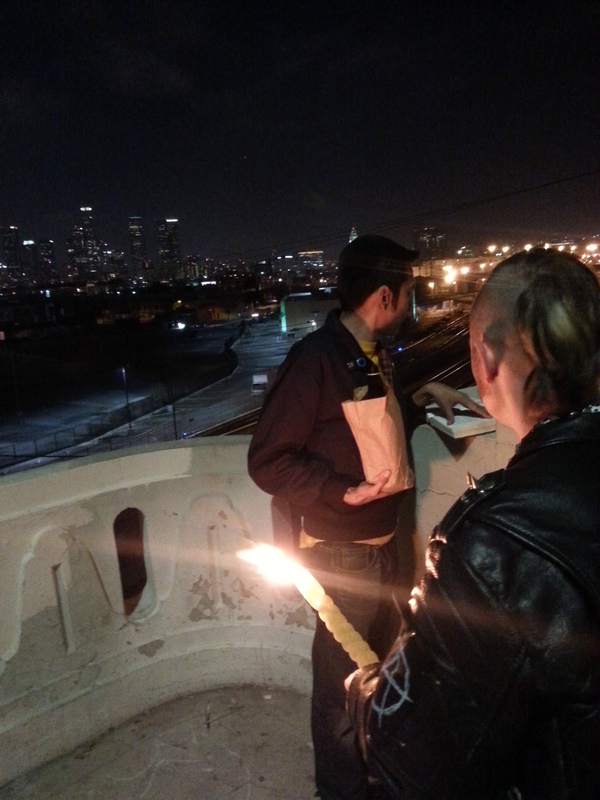 Havdalah at the 6th Street Bridge, overlooking the city. Dare to make anyplace a sacred space! Punk rock Havdalah with Shmueli Gonzales and Jesse Elliott. Los Angeles. And then out from my ubiquitous bag I take these items. 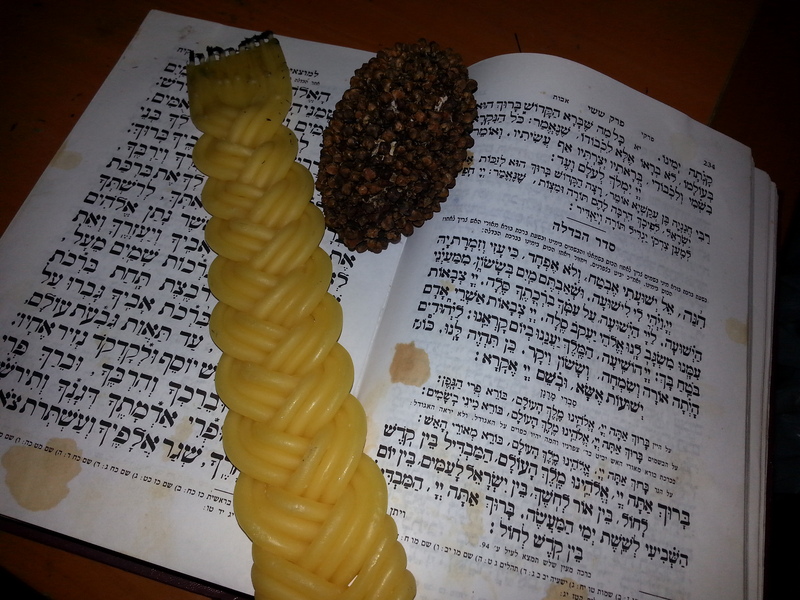 A Hebrew prayerbook, a dried etrog and clove bundle as a D.I.Y. “spice-box,” a kiddush cup and a multi-braided havdalah candle. Havdalah – the ritual for closing the Jewish sabbath – has always been one of my favorite Jewish traditions. And over the years I have always tried to make pause to observe it with the people I care for the most. There is something very warm and loving about the ritual. Something which has always captivated me, and has interestingly drawn my friends in along the way. Indeed most of my local friends are not Jewish, and consider themselves firm atheists. I am one of the less than a half-dozen Jews who are currently connected to Boyle Heights. And among them few Jews, I’m pretty sure I’m the only one who is strongly religiously observant. 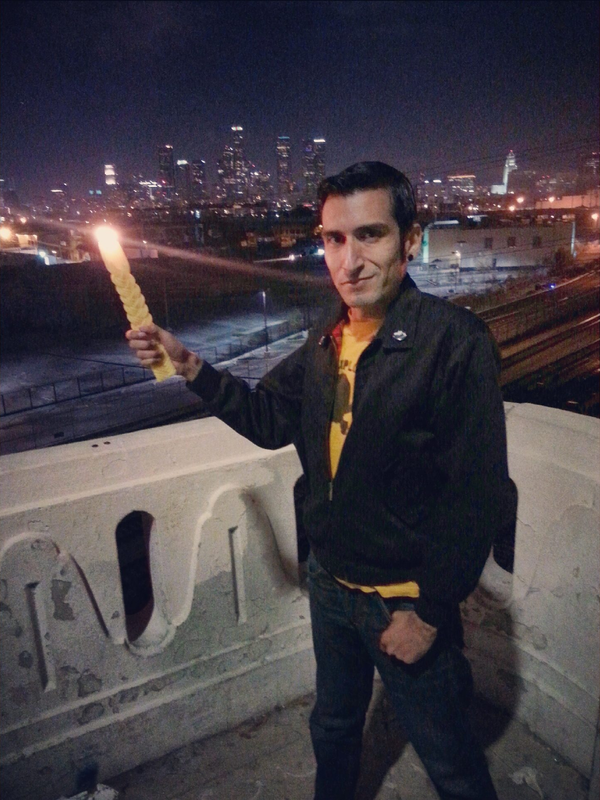 Nonetheless my friends – Mexican-American, Anglo, African-American, Asian, and especially my older Jewish friends of mine who were born in classic Boyle Heights – they all encourage me to do Havdalah. And they also love to include themselves in this ritual, which is so part of my life. Even the occasional homeless Jewish person. In a very fundamental way, over the past few years my adventitious return of Jewish rituals such as this back to this historical multi-ethnic neighborhood – one which itself has such a deep and rich Jewish history – has really touched people. These are symbols that the light of Jewish life and expression has not been fully extinguished here. It reminds the community that we haven’t forgotten those who went before us here, who also embraced these enrapturing acts. 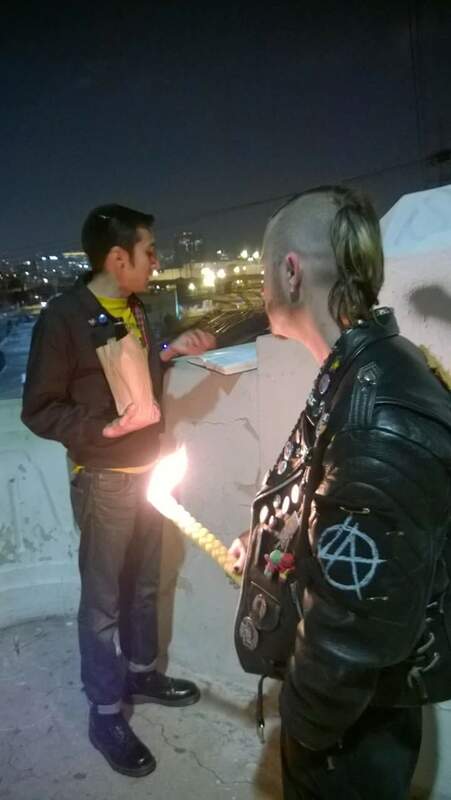 A revelation of how much a part of my routine and how meaningful it has become to others came when I ran out of supplies recently, and my punk rocker friends went scavenger hunting to find me items to make havdalah with on the spot. Knowing that my joy would not be complete without this moment, they just had to find a way to improvise! A very sweet and revealing moment for me. To say the least, I learned after that to never be caught without supplies again. This week we will use a new candle. A long bees-wax candle with nine wicks all braided together. Standing at the observation point overlooking the skyline of Los Angeles. Lingering at what could well be considered the gates of the city, we make our stand. My prayerbook placed upon a decorative niche of the bridge as a shtender. As I stand there above the train tracks and the water of the river, suspended between heaven and earth. There I light the wicks. I wait for the flames to take hold, until it comes to a roaring flame like a torch. Before I hand it over to one of the guys, who are ready to take it in hand and hold it high. 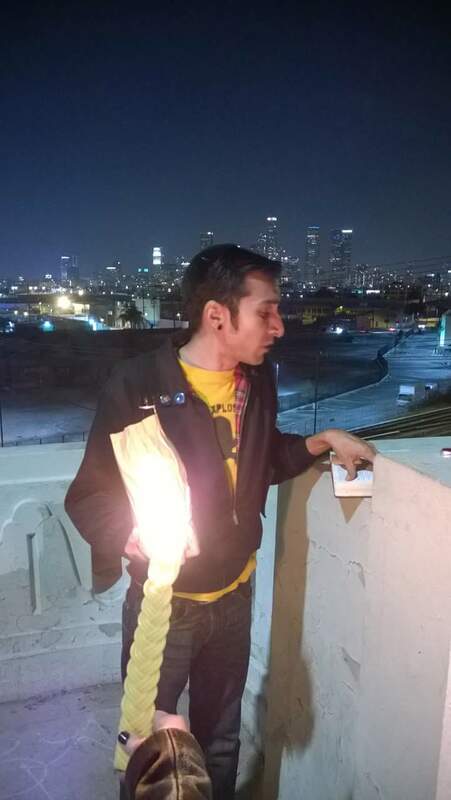 Overlooking the city I can’t help but be reminded of the Talmud section from which we get this most ancient custom of using candles as a torch. In Pesachim 8a this conversation takes off with the sages calling attention to why we use bright lamps and lights, namely to search. Our sages draw from the prophets, on how G-d will search the city of Jerusalem with lamps, in order to punish the complacent; those who are indifferent to realities of good and evil. (Zepheniah. 1:12) With a light that is meant to search out for justice. So among this most motley crew of eastsiders, among the most unlikely of circles I make my stand, and I bless from this place. From this cultural corner of Los Angeles my heart calls home, I stand with other diamonds in the rough. Among other unique souls worth searching for. This tradition challenges me to search people out as with a penetrating light, looking deep into their souls to find their worth. I love the symbolism of this candle. Braided it represents the separations between the spiritual and physical wolds, and mystically symbolizes how they come together; to be intertwined. It represents the separations between the sacred and the secular, and also how they come together. That they are both needed in our lives. A symbolism which is poignant as we step out of the sacred joy of Shabbat, and into the secular workweek which we have before us. As we stand at the cosmological gates between the sacred and the secular. And it also represents the souls of people, who are distinct; we are each our own flame, but in unity we must intertwine ourselves for the purpose of a mitzvah. Together our small and single flame becomes a roaring torch; for we are much better together and united. The sages then call attention to our own souls, in the light of this mitzvah. It says to consider ourselves as though we are search lamps. But as for this torch, to consider it as comparable to the presence of G-d. That our souls are as bright as lamps, standing next the presence of G-d – in the most radiant light of the Holy One, blessed be He. As the true torch, the most beaming of lights, the Shechinah – it is as thought the surrounding presence of G-d is made manifest among us as we stand with this light. When I extend the lights of this multi-wicked candle I am welcoming the presence of the Shechinah – the presence of G-d to this place. Welcoming the all-encompassing spirit and the life of all the worlds to this place. For a moment spirituality becomes an almost tangible atmosphere. 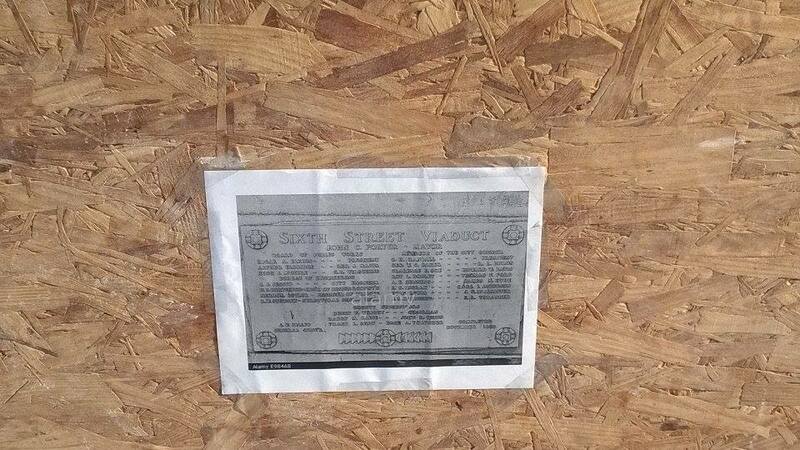 “Shalom and Son’s,” a kosher food and wine distribution business operating in the Boyle Heights Flats. The Talmud further instructs us upon this subject of havdalah. That we need to include at least three distinct blessings, but adding no more than seven; not more than the days of the week, whose cycle we are renewing with this act. I take my drink in hand as the ceremony begins. Today we are without wine or kosher grape juice, which is a shocking thing. 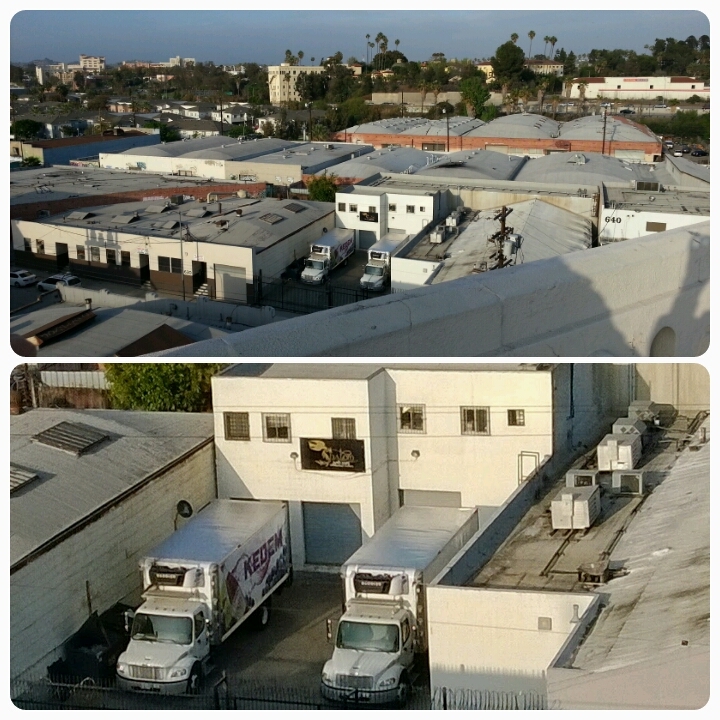 Considering that underneath us, and just a few hundred feet to the east of us, right in the Flats of Boyle Heights, on Anderson sits a kosher food and wine distribution plant with their Kedem trucks parked in their gates. One of the few present-day Jewish businesses of Boyle Heights is “Shalom and Son’s,” which by way of this neighborhood supplies so many Jewish tables in Los Angeles with this staple of wine as a liquid symbol of joy. Yet we are all out after days of celebrating, and they are closed for shabbos. So the wine-cup goes away and a beer is placed squarely in the palm of my hand. As we stand upon this massive chunk of concrete and metal, I chant the words in Hebrew. For me, the words become more alive here, at this spot and among these friends of mine. This is our “mishgav lanu” – this is our stronghold, our fortress, our hideout. It is only right that I come here to make such a mitzvah. The rain has just passed, so the river is filled with water. You can hear the faint rushing below, as my soul draws water with joy from the springs of salvation. The sights and sounds are all so vivid. Aside from the sound of an occasional train below and the rush of a bus at our side, the only other sounds are from the cars passing over the bridge to and from downtown. And the faint and distant rumbling of the freeways which are integral to this viaduct. Though this is the choice spot to observe this city from the eastside, we are among the few people who come here, as mostly its just locals and homeless people. More often these days the occasional hipster does come out of the arts district, but sadly they usually take one look at us edgy punkers standing upon the bridge and nervously turn around instead. And for a moment, walkers take pause as they pass. And the drivers who are weary, my friends say they can catch a glimpse of the awe on their faces as well as they pass. No fear nor even dreary eyes for just a moment. Just awe and wonder as people witness this amazing sight. As we perform the ceremony cars honk at us as they go, joining in like urban “amen”s. “For the Jews there was light, gladness, joy and honor (Esther 8:16), so may it be for us! So I then lift my drink. Today day we need to brown-paper bag it, since we are out of the kosher grape juice. We will have to exchange out one the blessing for wine with the appropriate blessing for beer (she’hakol). As I lift my drink and at the right moment along with the words of the ritual. And I say the words of respect and reverence: “Savri maranan ve-rabanan ve-rabotai / By your leave my masters, teachers and gentlemen…” Words which ask permission of my guests for me to bless before them. But also mystically, when we say the savrei maranan – it is meant to symbolize a deferring of reverence to our Jewish sages, rabbis and masters who have gone before us. We acknowledge that through their teachings and traditions they gave us, that they still are living to us and with us. I show respect to them before I proceed. Now it is the Jewish custom to bless, over a cup which is filled as near as we can to overflow. So that our joy should be the same, spilling and running over. (Psalm 23:5) And it really seems to, as I say the blessing over the drink. Next we take the bundle of spices. Made from an etrog – an Israeli citron used during the Sukkot holiday for the mitzvah of Lulav right here in the eastside community – which was dried with cloves, as a spice-box. I say the blessing over the basamim; the fragrant species, the spices and herbs. The Jewish tradition says that an extra soul is given to each Jews for the celebration of Shabbat, an additional soul to have twice the joy! But when the sabbath leaves us, so does this extra soul. This transition from the hight of joy to the lowly place of mundane life can be deflating. But in order to awaken our spirits anew, to rouse them to attention we use these spices. They are our traditional smelling salts, but they are instead intended to help arouse our common soul to life once again. Pleasantly reanimating us after our long day of Shabbat celebration. We each take a moment to deeply inhale this fragrance, passing it around the circle. Next Jesse draws the candle low, within reach of us all, as I say the next blessing; “borai morai ha’aish.” As I bless G-d who creates the illuminations of fire. Tradition says that fire was created on the first Saturday night, at the end of the week of creation. (Pesachim 53b) When G-d gave Adam, the first man, the knowledge to rub stones together and create fire. We recall this act now, commemorating that very moment in order to reenact the wonders of creation, in which we are also active partners. I meditate upon this hope now, that G-d may likewise continue to give us the knowledge to continue to do awesome works of creation in this world. And now near the flames we all hold our hands close and cup them, to see the light passing through the tips of our fingers. Not between them, but shinning through the translucency of our fingertips. For a movement I consider how the spiritual world and the Divine, it is hidden from view. We can only merely perceive this realm of spirit as a flame, the reality of which shines through from within our own holy being, as through good deeds this holy light emanates outward from within us all. So for a moment I again make a mystical reflection as I look at these hands which I try so hard to use for good deeds. The Zohar, the main mystical text of Kabbalah which interprets the Torah, it tells us that when G-d first created man we were beings of pure light, translucent bodies which were “clothed in light.” And that from the depths of us, our souls would shine brightly to the surface from within. But that after the sin of the Tree of Knowledge of Good and Evil, the consequence was that people lost their vestiges of pure light and became beings of mortal flesh. However, this tradition tells us that G-d let humans keep a reminder of our former state, in the translucency of our fingertips. When I hold my fingers close I remind myself of this truth, that I am a being of light. A light in this world and this community, a light which will shine through to the outside world through my tireless work I perform with these very hands. This is a truth I strive never to forget. I really consider these words deeply each and every time. The word that stands out to me is the key word of this ceremony, hamavdil. The word hivdil – in Hebrew, it means to distinguish. We draw our understanding for this word from the Torah, from the book of Leviticus which contains the holiness code; there we are told to be holy, and to be distinguished people. There we are told to separate ourselves and stand apart, to be holy by keeping the Torah laws which keep one sanctified (i.e. keeping kashrut; Leviticus 20:25; 10:10; 11:47). This word likewise brings to mind how on Shabbat the Jewish people are to separate from the world’s secular activities and all its toils and embrace the joy of the sabbath. That it is as different as the difference between light and dark, this embracing of the sacred over the “profane.” And so too, as a people who keep these ways we are distinct and unique because of these practices. Lately, I feel that far too many times when religious people speak regarding this they focus far too much on the idea of separating themselves from that which they feel is “profane.” From people and a society which they feel are less than kosher; less than sacred. But I don’t believe that is what it should actually mean to us, here and in this place. In this place with this mixed assembly of people; Jews and non-Jews, religious and secular, cultured and counter-culture. The word hivdil means to distinguish. It’s often used in everyday speech to contrast one thing to another, not to really compare as there is no real comparison. As they aren’t really meant to be compared against. But it doesn’t just mean that, it also means that you can tell something apart from the rest. You can tell what it is, as it stands apart and is recognizable for what it is. I remind myself that I am special as a distinct person as a Jew, and so is each of these friends of mine distinct in their own way. Zero-Renton Prefect, Shmueli Gonzales, and Jesse Elliott. 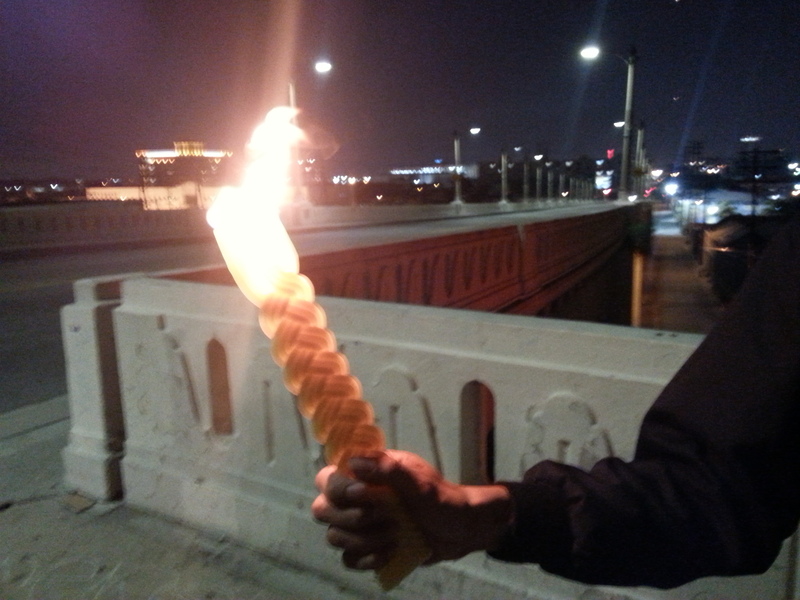 Again, I bring our attention back to the candle. To recognize that life and the world is like this braided candle. There are certainly distinctions in the world and between people, but in our own ways we are unique lights in the world; just like each wick upon this braided candle. Though we must allow ourselves to be intertwined! Just like Shabbat is intertwined with the work-week, we must have one in order to have the other! We need to have a partnership between the sacred and secular. We could not have the joy of the sacred, without the labor of the week and its secular duties. So too, the sacred and the secular both have their place and their time to shine. But now as this joy of Shabbat must come to an end, we must hivdil – we must separate – from the radiant light of a most holy Shabbat and begin our toils anew. And as the blessings of havdalah come to an end, I drink from the cup and I extinguish the candle with a pour of drink over the flames. Putting out the light of Shabbat until next week. And as we make our way back home to the eastside over the bridge I begin to sing the traditional songs. Among them are “Am Yisrael Chai” and “David Melech Yisrael.” Songs of life! And as we pass the old Jewish sites, we remind ourselves that the works of the Jewish people and the joy of Jewish life are still flickering to life here. And keep in mind that the spark of this Jewish heritage needs to remain alive, to continue to contribute to the diversity which has enriched Boyle Heights for the past century. To show some continuity in the community, where change and modernity seems to quickly be making many things around here all but a memory. 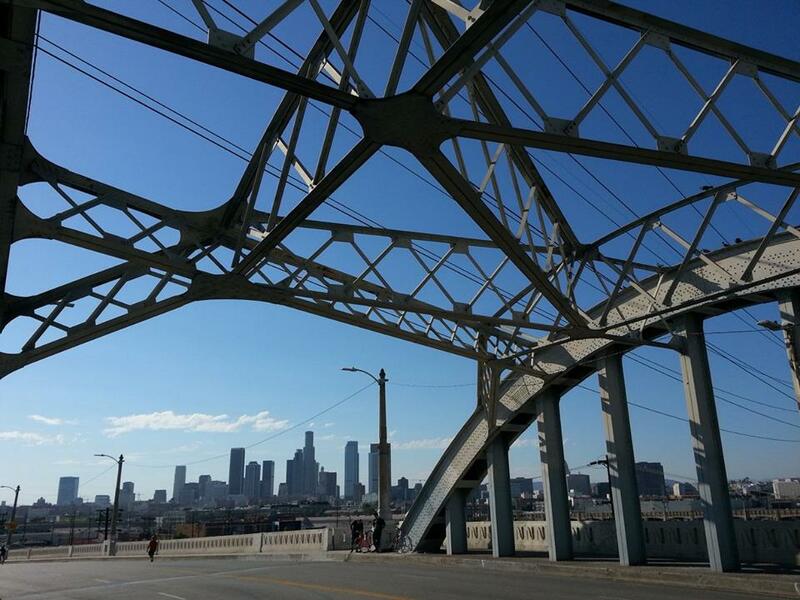 The canopy of beams and girders of the Sixth Street Bridge, by daylight. She is set for demolition in 2015. But sadly, even this last-stand act of havdalah is going to change for my circle in the near future. After all these years of hanging out at the Sixth Street Viaduct, I’m sorry to announce that the bridge is being demolished. 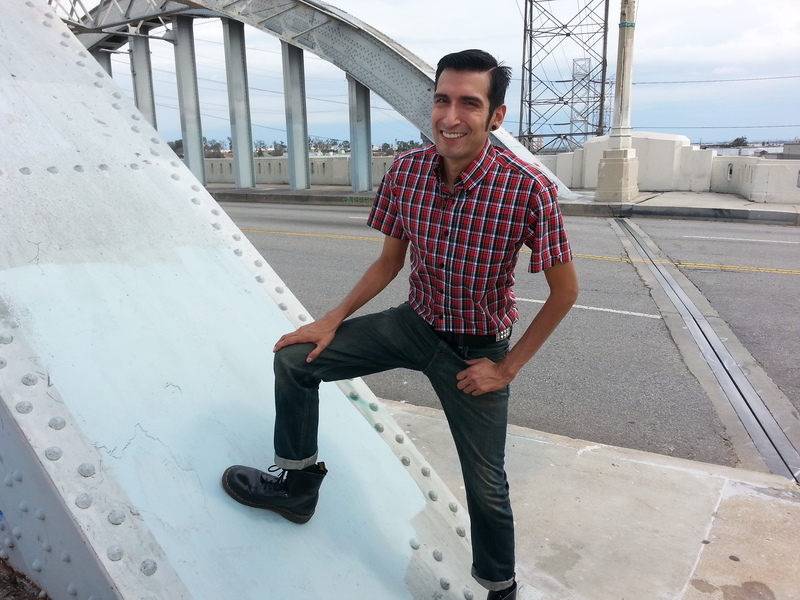 This iconic bridge which has graced the Los Angeles landscape since 1932, she is suffering an alkali-silica reaction in the concrete (called “concrete cancer” by engineers). This reaction creates cracks in the concrete, which are now seen covering all over the body of the structure. With a 70% probability of coming down in the next major earthquake, this most famous of Los Angeles sites is being demolished. It will be closing this Spring of 2015 and demolished in the following months, to make way for a newly designed bridge which is expected to open in late 2019. So where will we perform havdalah in the future? I don’t know. Now, it’s not that we haven’t tried other spots for havdalah. But they don’t feel the same, and this is where people know to come and join in if they want to. It’s going to be interesting to see if I can recapture this spirit elsewhere. Let me give you one last precious story, from this past week. A special havdalah which really touched me. This past week my dear friend Irv Weiser calls me while I’m on the bridge. He calls right as the boys are heading back, because as non-Jews they had plans for a ham related holiday feast! Oy, what a dilemma! I was sure I was gonna miss havdalah on the bridge this week, the ceremony which closes the gates of Shabbat. In the face of the rare occurrence of not having any participants, I was thinking I’d have to do it back at the house on my own. But Irv calls me and says to stick around. That he was just a few blocks away having coffee with a Mexican Jewish man, a homeless friend of his from the eastside. They were wondering if they could join me for havdalah. So we went up and they said the blessings of havdalah with me. Irv, was born and raised Orthodox Jewish in the neighbourhood of Boyle Heights. And educated at the Breed Street Shul and local yeshivot. He says he’s agnostic now. But as I begin the ceremony he starts to join in the Hebrew prayers. And tell me touching stories of his parents, who were holocaust survivors and who came to Boyle Heights after the war to join a relative already here. He related to me how his parents used to perform the ceremony, and how they pronounced the words in their Eastern European accents. He then takes a look at the skyline and across the bridge, which he hasn’t seen that way since he was young… now he’s in his 60s. But all the more he’s in awe of the sight after all these years. As we completed the ritual with song and stories, Irv thanked me for keeping Jewish tradition alive here in this way. As a means of keeping the memory of the legacy of classic Boyle Heights alive, even today after the once predominate Jewish community started migrating away from the neighborhood some 50 years ago. Irv also expressed his gratitude to me, for investing myself into nurturing the future Latino Jewish community on the eastside. A growing community of Jewish Latinos, who are noticeably becoming integral to the future of Jewish expression here and in our local synagogues. Though it is most common to make havdalah over wine or grape juice which requires the blessing “pri ha-gafen,” (fruit of the vine) one may also say havdalah over any type of pleasant drink if kosher grape juice is not available; anything except for water or a common drink like soda (according to Rav Moshe Feinstein), which is meant mainly to quench thirst. One should pick a drink which is considered a sociable drink. This can include even coffee or tea (with or w/o milk), or other fruit juices. However, Sephardic rabbis such as Rabbi Ovediah Yosef suggest that the use of intoxicating drinks such as wine, beer, etc. is choicest. One should say the appropriate blessing for what ever drink you choose, in place of the blessing for “pri ha-gafen” (fruit of the vine) when noted in our siddurim. If you do not have a havdalah candle, all you need to do is find two candles and hold the wicks together. 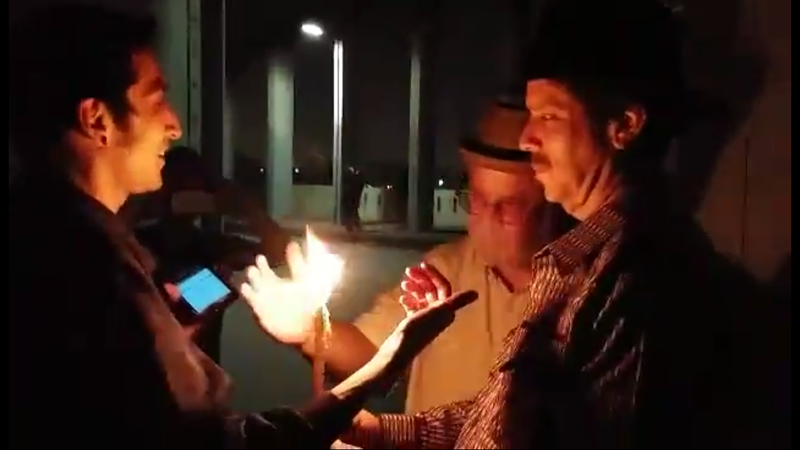 Pick a couple of friends out and have them hold the candles with the wicks touching through-out the havdalah ceremony. This is also a great way to physically display how our individual lights are so much stronger when people come together in unity. My name is Shmueli Gonzales, and I am a writer and religious commentator from Los Angeles, California. I dedicate the focus of my work to displaying the cultural diversity within Judaism, often exploring the characteristics and unappreciated values of Chassidic and Sephardic Judaism. Among my various projects I also produce classical liturgical and halachic texts for free and open-source redistribution. I am a proud member of Congregation Beth Shalom of Whitter – a modern-traditionalist Jewish congregation – where I also teach “Introduction to Judaism” and coordinate Spanish language programming for our growing Latino Jewish community here in the Los Angeles eastside and the San Gabriel Valley.